Suspected PF cadres in Nampundwe Tuesday afternoon abducted and poisoned a UPND supporter after allegedly injecting him with an unknown chemical. Oswald Mweemba, 37, of Nampundwe and seven others were abducted by armed suspected PF cadres soon after casting their votes at Chiyaba Polling station. 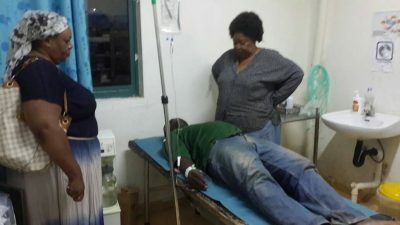 Mweemba who was brought in an unconscious state at Levy Mwanawasa Hospital is still battling for his life as he is still in a critical condition. According to Mweemba’s elder brother, Benge Chilindi’s statement, his brother was picked by armed PF cadres who were using a black land cruiser. “After voting, Mweemba and his friends were on their way back home when they were ambushed and thrown into a land cruiser. They were badly beaten and warned not to encourage other people to go and vote,” narrates Chilindi. And medical doctors at Levy Mwanawasa Hospital are yet to establish the chemical which was used to inject him. UPND’s Namakau Kabwiku and Doreen Mwamba witnessed the arrival of the unconscious Mweemba at Levy Hospital.